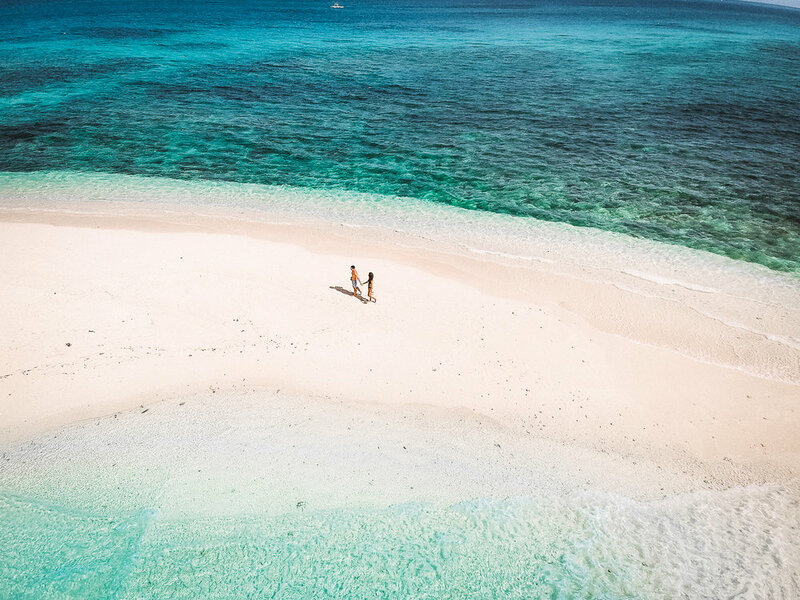 Assuming your flight arrives in the morning or early afternoon, your first day in Siargao will be to relax at the beaches and get your bearings around General Luna, the main tourist hub of Siargao. Walk on the Cloud 9 pier to watch the pro surfers or even take a surf lesson yourself. Jacking Horse is a great surf spot for beginners and you can easily book a lesson and board rental for 500 PHP/hour right there on the beach. If you're a little more experienced, the locals on the beach can tell you when and where to go! There are so many beaches on the island and many are likely to be completely empty. One of our favorite beaches near General Luna is Doot Beach. We had this beach entirely to ourselves and the water was so hot, it actually felt like sitting in a hot tub! Otherwise, take the rest of this day to explore the restaurants and shops on the main street of General Luna and book your tours for the following days. On your second day, you will take to the seas and explore the small islands off the coast of Siargao. These islands have some of the bluest waters, white sands, and even stingless jellyfish! Most island hopping tours that you see in General Luna only go to the three islands that are 30 minutes off the coast of Siargao: Naked, Guyam, and Daku. These three islands are very small and the only activities are swimming, laying by the beach, playing beach volleyball and such. Most of these tours will include lunch and some will even include unlimited alcohol. Expect this type of tour to leave at 8am and get back around 3 or 4pm. We did this tour with Kermit Siargao and it set us back 1000 PHP per person but included lunch and unlimited beer and rum. If you're pressed for time or just want to pack more into the day, an alternative is to add a visit to Sohoton Cove onto the classic island hopping tour. Sohoton Cove is located about 2.5 hours away from Siargao by boat. At Sohoton you can swim with stingless jellyfish, swim through a bioluminescent cave and even jump off some small cliffs. 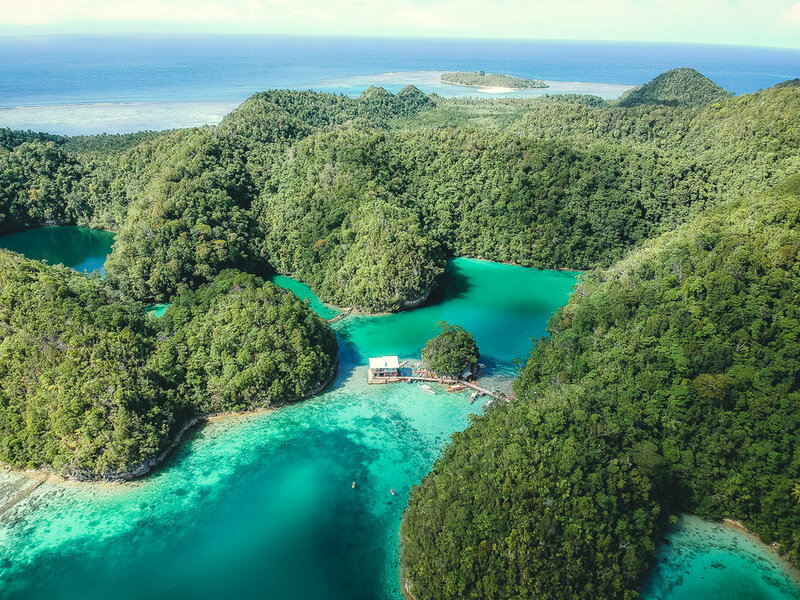 After a few hours of boating around the blue lagoons and incredible landscapes you hop back on the boat for 2 hours towards Siargao where you will then stop at the 3 small Islands along the way. Expect this kind of tour to leave at 6am and return around 4 or 5pm. Cavys Homestay hosts this combined tour for 1700 PHP per person. On this day you will be exploring Siargao Island by land. For this you may want to rent a scooter for 350-500 PHP/day or a custom motorcycle from Loose Keys for 800 PHP/day. This is the highlight of the day and this is what you’ll be planning your day around. Look at the tide tables here and check when low tide is. These pools only exist at low tide, so we recommend getting to Magpupungko around an hour before low tide so you have time to enjoy them! We could easily spend the whole day swimming and cliff jumping into these beautiful tide pools. Between General Luna and Magpupungko you will find several quick pit stops. 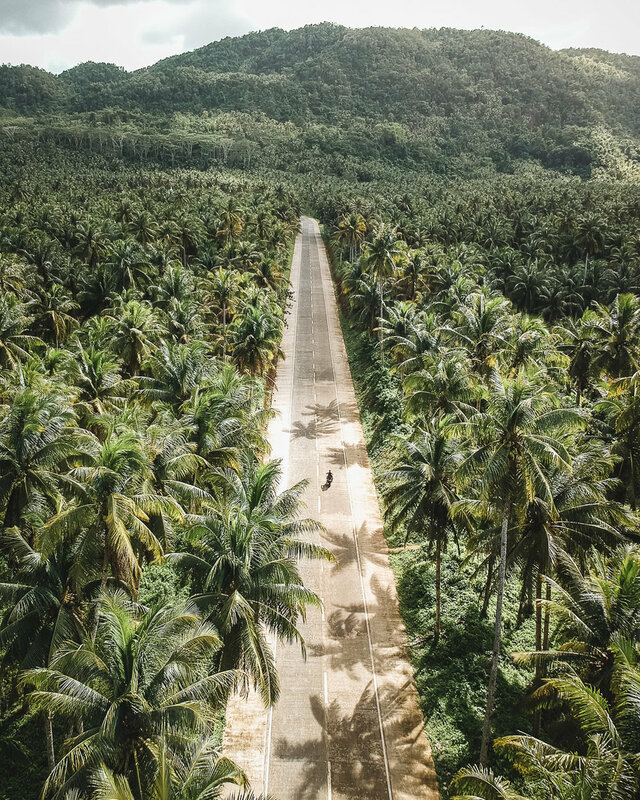 After you make thse sharp right turn off of Dapa-General Luna Road you will drive through several epic palm tree lined roads. You’ll also pass a viewpoint where you can see a clearing of thousands of palm trees from overhead. The next thing you'll pass is a red bridge crossing the Maasin River. If you pull over here you will see a giant crooked palm tree jutting out into the middle of the river. This is where you’ll find the famous palm tree swing in Siargao. After a couple of swings and backflips cheered on by the local kids, you can continue on your way. The final stop between General Luna and Magpupungko is Tayangban Cave.You'll trek through a pitch black cave in chest deep water (with a guide, of course) and emerge into a clearing with a beautiful clear pool with some rocks you can jump off of. The whole experience takes around 30 minutes. For day 4 you'll head to the surreal Sugba Lagoon for a day of activities on the water. This is generally a full-day trip, so there won't be time to do much else. The boats leave from Del Carmen, so if you're staying in General Luna your day will start out with the one hour drive there. After the drive, Sugba Lagoon is only a 30 minute boat ride away. Upon arrival you will set up base in the 2-story pontoon house at the center of the lagoon. Here you will find a 3 meter diving board where you can practice your jumps and watch others wipe out. Otherwise, rent a SUP, kayak or bamboo raft and explore the various turquoise lagoons around you. Expect this type of tour to leave around 7am and get back around 4pm. We booked ours with Kermit Siargao which cost 2000 PHP per person including lunch. However, if you have a group of 6 you can book a private boat directly in Del Carmen and end up paying closer to 500 PHP per person excluding food and transport to Del Carmen. Soultribe Beach Retreat ($$) - Beachside cabanas and tents for those looking for a hip glamping experience. Scooters - The roads in Siargao are very new and nice so scootering is easy. The rates for renting a scooter are around 500PHP for one day, 400PHP/day for two days, and 350PHP/day for more than two days. Tricycles - These essentially act as the taxis of Siargao. These three-wheeled vehicles are a cart attached to an underlying scooter. These carts can fit up to 5 passengers and you'll pay around 20-30 PHP per person for short rides within General Luna. Vans - For getting to and from the airport you can easily find a van for 300 PHP per person. You can also rent your own 6-person van for 2500 PHP per day. Here's a break down of how much you can expect to spend while in Siargao! Accommodations seem to fill up quickly so booking in advance may increase your options! Also, traveling in a larger group can save loads of money on tours if you book a private boat. Are you planning on going to Siargao or have you already been? We'd love to hear your questions and comments down below!